Some of my favorite "family time" is spent tromping around new places looking for designated containers of various shapes and sizes in which to log our names. The girls have learned along the way that life is truly about the journey, not the destination. From time to time we have been temporary custodians of Travelbugs. (Follow the link for the best explanation.) On our recent trip to New Orleans, I set my first travelbug free. Meet the Stitchin' Witch Travelbug. 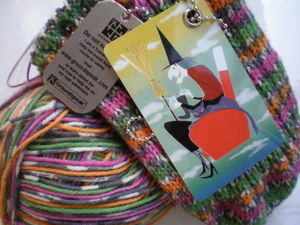 The travelbug dog tag is attached to a luggage tag that bears a witch knitting socks...quite appropriate for my first bug. The goal I've assigned to her is that she travel to "magical places" and hopefully meet some knitters/sheep/llamas along the way. She was picked up from the initial drop point and is currently on her way to Oregon. Knitting seems to find its way into each of our pasttimes! Originally, "F" was supposed to be for "French Quarter" but I forgot to take a "proper" photo. Then, "F" was almost "Family" because of a great shot of my family that will accompany Luke on his upcoming "World Tour" but, insert Murphy's Law here, the photo doesn't appear to be on THIS computer. Then, "F" was going to be for "Frames" when my eye appointment came around. Have you ever attempted to take a picture with dilated pupils!?! Not a pretty sight!!! Clue 2 was Finished. Finished. It sounds so nice when it's Finished. Finishing, doesn't provide the same sense of satisfaction that Finished does. "The spring vest back needs Finishing." 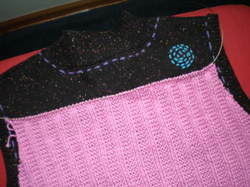 Wouldn't you agree that "The spring vest back is Finished. ", sounds much sweeter? And don't even get me started on the word "Finish"!!!! 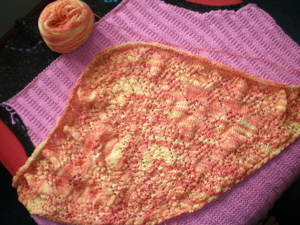 I still need to "Finish" the baby sweater! (The baby was born and is nearly two at this point!) Why does "Finish" bring such dread and loathing when "Finished" brings such joy and happiness? We can hardly have "Finished" without "Finish" or "Finishing". Thankfully, "F" is now "Finished". BTW Grammar Note: "Pot roasts are "done", people are "finished"." That's how my college roommate corrected me each time I'd say that I was "done". Now I'm finished. My blood is absent even a single drop of Irishness. (Thankfully, Doogie's has a drop or two...now our kids have the complete European set!) But, for those of us without Irish roots, March 17th comes and we ALL become Irish (at least for the day). 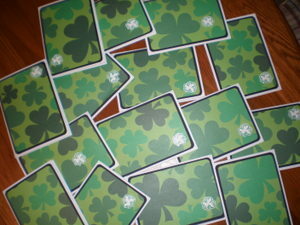 So I jumped at the chance to make St. Patrick's Day themed cards for this month's Ravelry Card Swap. Who wouldn't jump at the chance to display a bit of green during these waning days of winter!?! There won't be corned beef and cabbage at our house tonight...but there will be Guinness Stew! 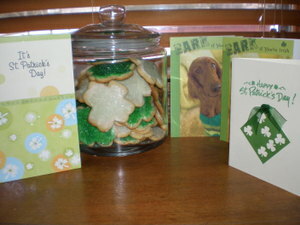 (And of course, a few shamrock cookies!) 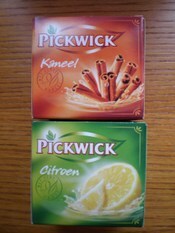 Thanks to Twinsunplus1, One Sweet Tart, Iansfav, and Archeologie for adding a bit of the green to my day! Question for my Ireland pals: Doogie's ancestors were from County Tyrone...a place named Plumbridge. The question is what is the pronunciation for Plumbridge? Is it "Plum bridge" or is the "b" silent for "Plum ridge". Just wondering. What to photograph? Chocolate, bunket, or any number of other foods? Not to mention the diamond houses we visited while in Amsterdam. 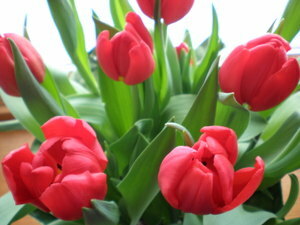 In the end, it had to be tulips... along with m y favorite Dutch teas. 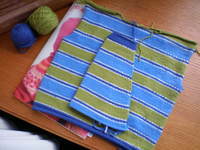 But my prized knitting related possession is my copy of Knitting in the Netherlands. 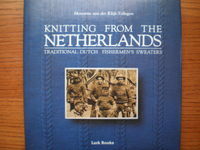 My Dutch ancestors were farmers, not sailors...but there may have been a sweater or two knit by the farmers as well! The next time I end up in Amsterdam, I'll need to find a spinner in order to purchase "local wool" to design and knit into one of the sweaters from "home". I'd wear it with pride...Dutch pride..."You're not much, if you're not Dutch!" 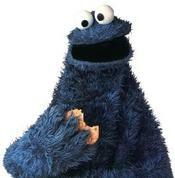 "C"...is for Cookie...always has been, always will be (at least for me)! As a child of the 60s/70s, the mere mention of "C is for..." has me humming the tune that my beloved furry blue Cookie Monster would sing so many weekday mornings during those early years. While looking up the song, Special K wondered what the commotion was. You see, kids no longer know Cookie's infamous song. In 1995, Cookie discarded his gluttony and vowed to make healthy choices (he was not renamed/replaced with Veggie Monster.) But really, he's Cookie Monster for cryin' out loud! I won't attempt to wax poetic on the lunacy that is "A Cookie is a Sometime Food"...others are far more articulate in expressing my thoughts. I KNOW that I cannot survive on cookies alone. 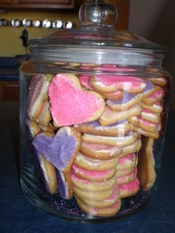 But, there isn't anything finer than a cookie made with love enjoyed with a cup of tea or glass of cold milk! "C" is for cookie...that's good enough for me!!!!! End of the month my "B"-day? 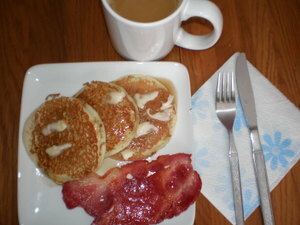 No..."B" is for "B"reakfast...my favorite meal of the day! "B"ut then, "B" could be for "B"ox. 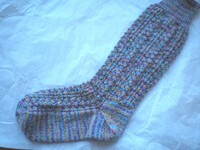 I received one from Malaysia from my Ravelry Valentine pal. 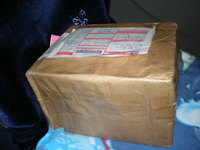 But since it's not Valentine's Day yet, I'll wait to open it.